Ariana Grande has changed up her hair countless times over the years, but one style we rarely see the star sporting is her natural, untouched bouncy curls. But after the “Thank U, Next” singer shared an adorable throwback of young Ari with her beautiful curly hair, fans started asking when they would see her rock the look again. “Are your curls still…. alive i would like to c it,” one fan replied to Grande’s tweet. Grande then explained that although it may be hard to believe she still looks just like her younger self sans glam. “if i’m honest ….. this is still exactly what i look like without lashes and my pony ….. anyone who knows me knows me knows ….. like …. i’m twenty five. i was five here. the only difference now is that hand now says bbq grill finger,” the pop powerhouse tweeted. She went on to say that since dyeing her hair an icy, platinum blonde color last year, it’s been a challenge to grow her curls back out. But they’re slowly gaining some length. “they gotta grow first ! that blonde last year …….. tarnished. BUT they’re like halfway back. :),” Grande replied to one of her fans on Twitter. Shortly after, a fan begged Grande to show them what her natural hair looks like right now as it grows out, so she happily obliged. 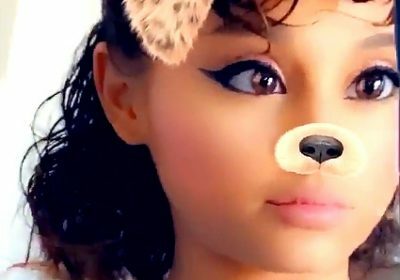 The “7 Rings” singer posted a brief video snippet on Twitter without any extensions in her hair. Grande wore her down to show the real length — falling right above her shoulders — along with her flowing curls and shaggy bangs. “PLS THROW AWAY THE EXTENSIONS UR REAL HAIR IS SO CUTE,” one excited fan tweeted upon seeing the star’s natural look. Though it hasn’t always been easy for Grande to wear her hair natural because, like when she dyed it platinum, the star also experienced damage when she bleached and colored it bright red for her Nickelodeon show Sam & Cat. Brazilian Women Swear By This Hair Treatment & It’s Finally Coming to the U.S.